Herwin, Inc’s Exteriorguard® was featured in two publications. 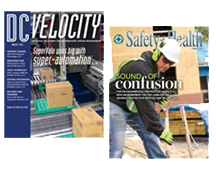 DC Velocity featured Exteriorguard® safety guardrail in its Rollouts section, “New Logistics Products & Services,” edited by David Maloney, page 68. Safety + Health magazine reported on Exteriorguard® in their New Products section on page 66. The article is available online at the following link: Safety + Health. Exteriorguard® uses a high tech safety yellow powder coating for each rail and post. This coating has been tested in a 2000 hour salt spray test conforming to ASTM B117. See the results of the salt spray test. You can also find more detail on our technical data sheet. Exteriorguard® posts have been designed to be mounted to concrete with special galvanized floor anchors. (4 per post) The free Exteriorguard® worksheet helps you to spec your exterior guardrail project. CALL TOLL-FREE at 800-868-5438 in US and Canada or International 1-724-446-2000. Our sales personnel will be happy to answer your questions and will confirm the order, payment terms and shipping date. ORDER ONLINE with the form on the Exteriorguard®page. Simply fill out the quantities desired for each item. Fill in the contact information and click the Submit Button. We will contact you to confirm availability, payment terms, and shipping date. DOWNLOAD AND PRINT the free worksheet. Complete the customer information. Using the grid, draw a layout of your project (including dimensions and other facts such as rail height). Fax a copy to 724-446-0988 or scan and email to sales@herwin.biz. We will evaluate your needs and develop an economical material list for your project, price the order, provide an estimate of freight costs with lead time, and fax a completed quote back to you within one business day.